The What: Comprehensive Connectivity Company has launched its new pro AV/IT HD18G series of 4K60 4:4:4 18G HDMI-over-fiber plenum cables for system integration and other demanding applications. The What Else: Comprehensive’s pro AV/IT Active Optical Plenum HDMI cables offer a low-smoke and fire-retardant plenum jacket, and provide Ultra HD 18G 4K 60 4:4:4 end-to-end performance. They enable high-speed, plug-and-play HDMI signal transmission up to 100 feet, making them well suited for AV distribution for conference rooms, classrooms, digital signage, or other demanding signal distribution applications. 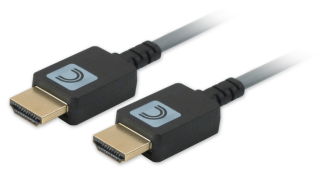 Comprehensive Active Optical Plenum HDMI Cables use active components in the connectors to perform electrical-to-optical signal conversion, drawing power from the HDMI port. Each Active Optical Plenum HDMI Cable is thin, light, flexible, and plenum rated to make it easier to pull through conduit. Comprehensive plastic optical fibers can accommodate very tight bends with no loss of signal, unlike glass optical fibers. The Bottom Line: Pro AV/IT Active Optical Plenum HDMI Cables send video using light pulses, which provide higher immunity to EMI/RFI interference and electromagnetic noise, and are HDR, EDID, CEC, HDCP, and RoHS compliant. They are also UL CMP-OF/FT-6 rated for all plenum applications, and feature Comprehensive’s lifetime warranty. They will begin shipping by early May 2017.